Ethiopia stands as a land apart: never colonised, the country celebrates and preserves ancient traditions. The fascinating cuisine is enriched with the different religious influences of Judaism, Christianity and Islam - a combination unique to Africa. The delicious dishes featured are Doro Wat, chicken slowly stewed with berbere spice, Yeassa Alichia, curried fish stew, and Siga Tibs, flashfried beef cubes, as well as a wealth of vegetarian dishes such as Gomen, minced collard greens with ginger and garlic and Azifa, green lentil salad. 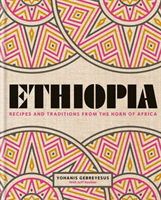 Chef Yohanis takes the reader on a journey through all the essential dishes of his native country, including the traditional Injera synonymous with an Ethiopia feast, along the way telling wondrous stories of the local communities and customs. Complete with photography of the country's stunning landscapes and vibrant artisans, this book demonstrates why Ethiopian food should be considered as one of the world's greatest, most enchanting cuisines.